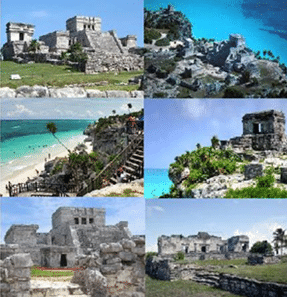 Explore the Mayan ruins of Tulum on this half-day tour on the afternoon of Sept. 28. Step into history when visiting the first Mayan city discovered by Spanish conquers in the 16th Century. This is the only walled structure built on the shores of the Caribbean Sea and one of the best preserved coastal Mayan sites. It is believed that this Maya site was formerly known by the name Zama, meaning city of Dawn, because it faces the sunrise. One of the most well-known spots, the building referred as el Castillo, served as a light house and was point of reference for leading sailors. After venturing through time, spend free time at the beach and be back to your hotel by dinner. There is a fee at the Mayan Ruins of 45 pesos, or US$4, for the use of video cameras (regular cameras are not of charge). This tour is highly recommended for everyone (kids & adults). Please contact tour director Ava-Gay Simpson directly at asimpson@coming2.com and use subject line: Live and Invest Overseas Conference. Should you be interested in other tours in the region, please contact Ava-Gay Simpson, as well, at asimpson@coming2.com.